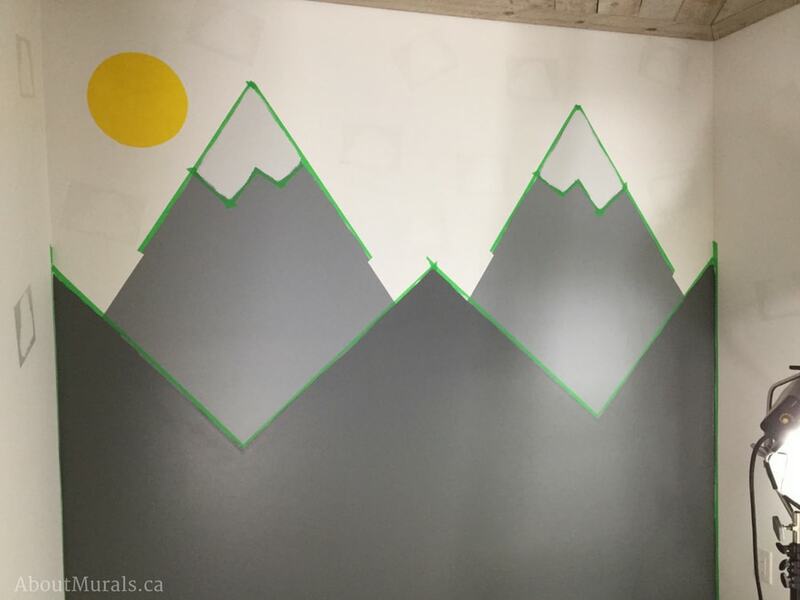 Thinking of a DIY mountain mural for your kids room? I was lucky enough to paint one on a TV episode of Holmes Next Generation and I snapped enough photos to put together a how-to guide for you. 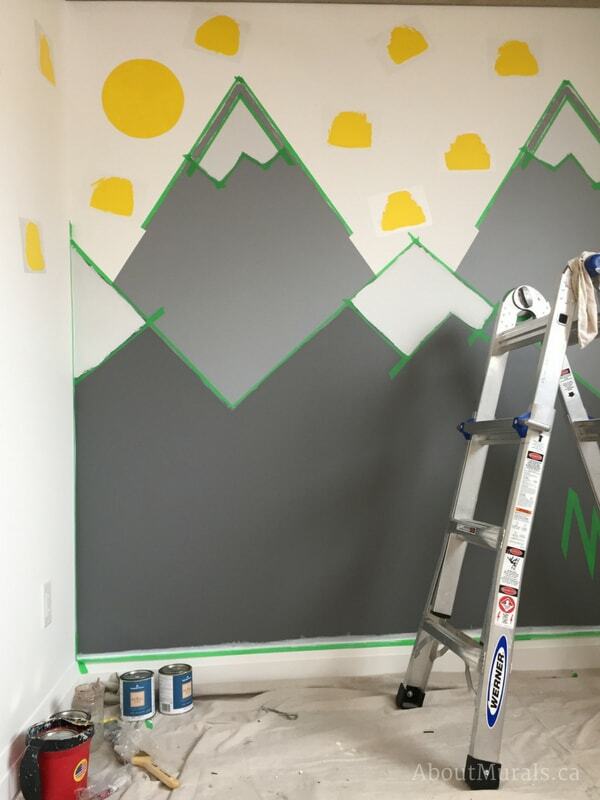 I’ll outline, step-by-step below, how to paint a mountain mural. 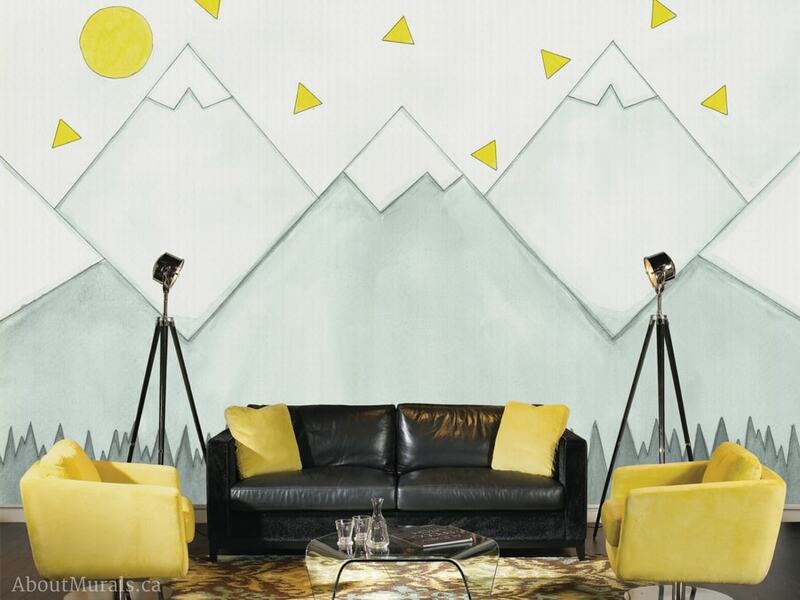 Get a Quote for a Hand-Painted Mural! 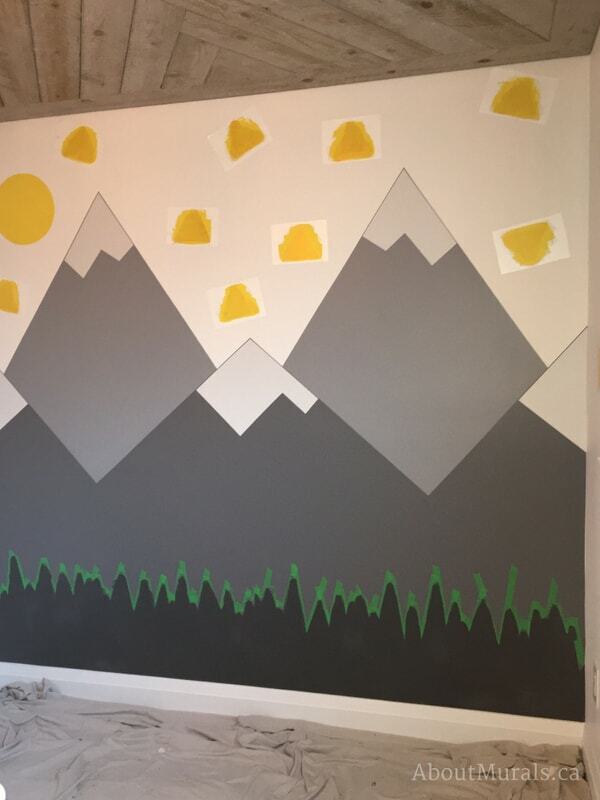 So here’s what my DIY mountain mural looked like. Sherry Holmes had never picked up an artist brush until that day and I helped teach her how to paint this mural with me. Check out the photos of her in action if you’re interested! I recreated it on removable wallpaper that ships for FREE in Canada and the USA. It only takes a couple hours to hang – and it’s super easy (here’s a how-to video). 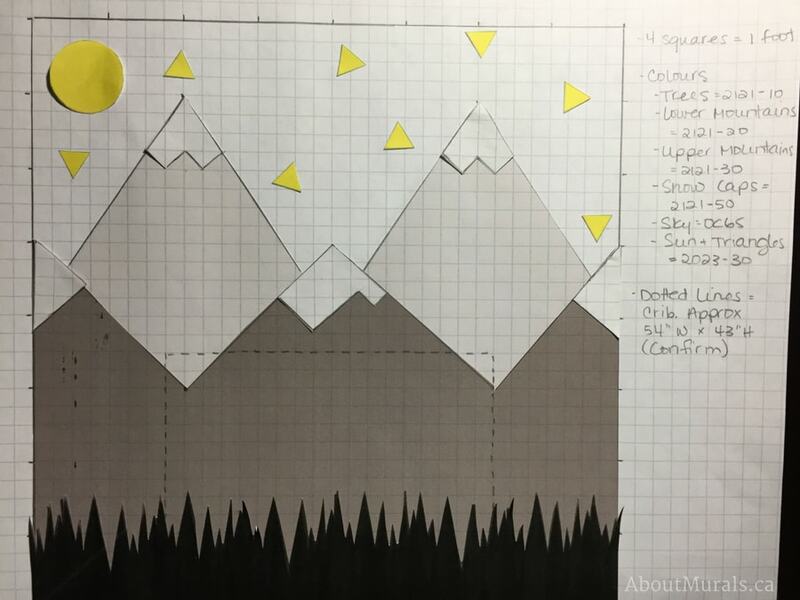 The most important part of a DIY mountain mural is to make a to-scale sketch (as close in measurements as possible). I use graph paper for all my mural sketches. The mountain mural I painted for the Holmes Next Generation show was on an 8’ wide by 8’ high wall. So every 4 small squares on my sketch equaled 1 square foot on the wall. The dotted lines on my sketch were the measurements of the crib. You don’t want to cut an important part of the mural off with furniture – another reason a sketch is so important! 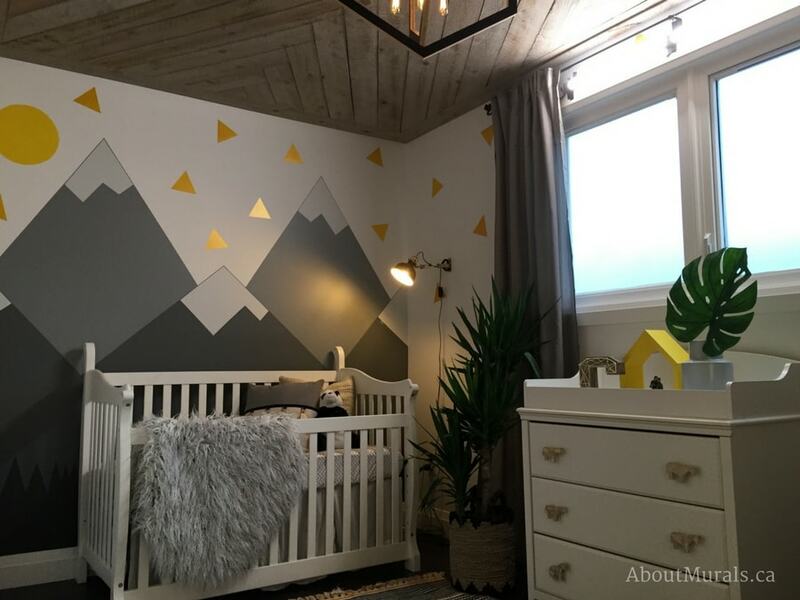 I always use Benjamin Moore paint as the background to my murals and Americana acrylic paint for the details – like the triangles in this mountain mural. Both are safe to use in a baby’s nursery. 2023-30 for the yellow sun and as the base colour for the triangles. It was also used to paint the closet doors. 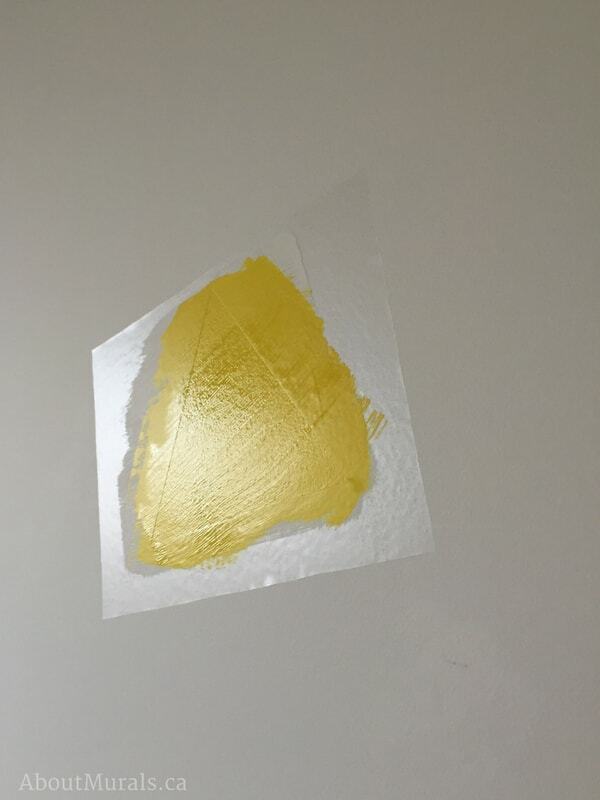 *I needed a gallon of the OC65 to paint the whole room, but only the quart size of every other colour for the mural. *One 59ml bottle was enough to cover all the shimmery triangles with 3 coats. Using your sketch as a guide, use a measuring tape to add a little dot (in pencil) at every point of each of the mountains. Once you’ve drawn each dot, use a level to draw the lines from dot to dot, creating the outline of the mountains. 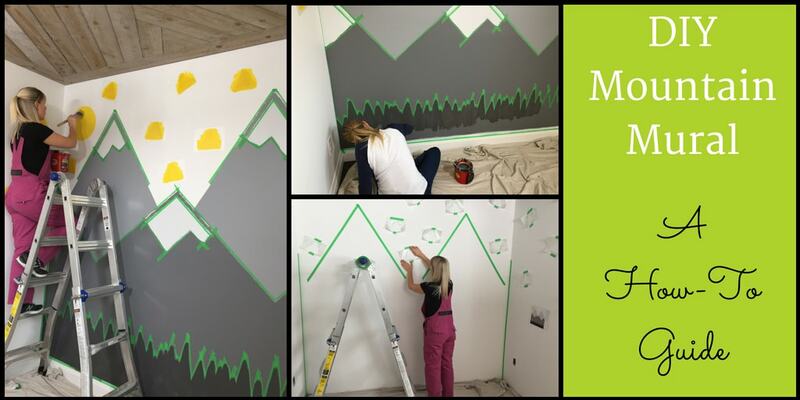 You can watch this short video for a better idea of how to start your DIY mountain mural. 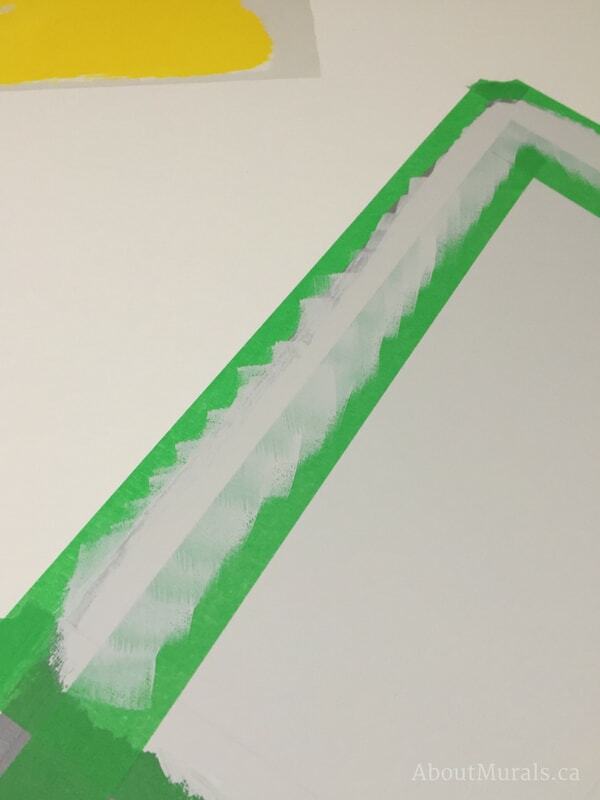 Add green painter’s tape along the edges of your pencil marks. To make sure none of the dark grey paint bleeds under the tape onto the white wall, use my super sneaky trick to seal the paint in. Did you try my super sneaky trick to seal the paint in? If you did, wait until the white paint dries and then paint the grey upper mountains making sure to paint down into the lower mountains (they’ll get covered with the darker grey paint once the upper mountains dry). Once the upper mountains dry, tape off the lower mountains. 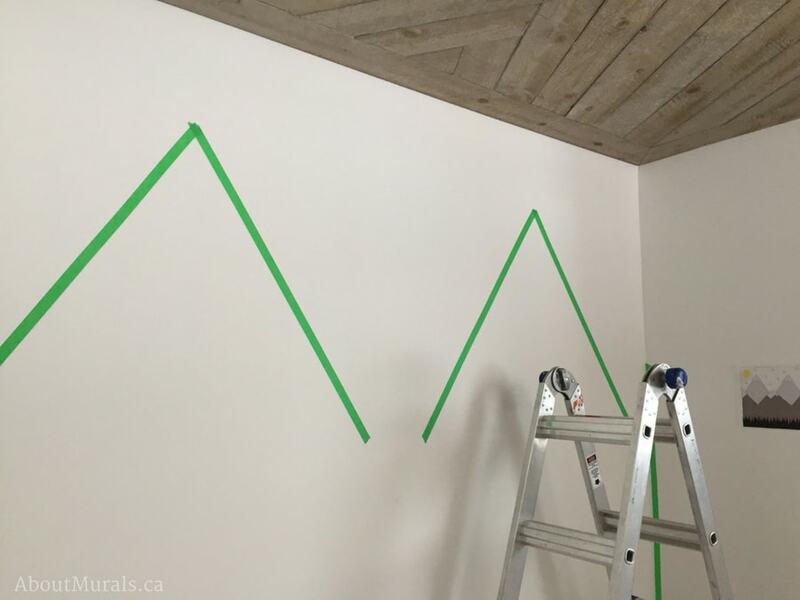 You’ll want to make sure the paint from the upper mountains fall below the tape so you can get a nice clean line from the tape. 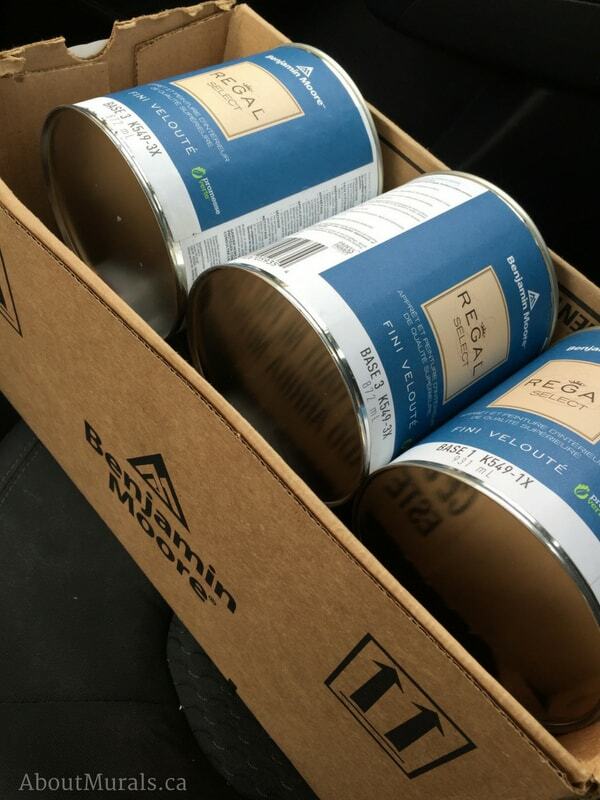 Use the super, sneaky tip to seal the paint with the medium grey paint again and once it dries, paint the lower mountains in the dark grey colour. Using the same sneaky tip to seal the paint, fill the snow caps in with the white paint. Because the snow caps are the same colour as the sky (or at least very similar), you’ll want to tape off a thin outline so the snow won’t fade into the sky. Again, use the super, sneaky tip to seal off the tape with the white paint first. Then use the medium grey for the upper mountain and the darker grey for the lower mountains to paint over it and make the outlines. Using a ruler and pencil, draw the triangular forest silhouette. I used an overhead projector to project the forest onto the wall, but you can free hand draw the forest if you want. 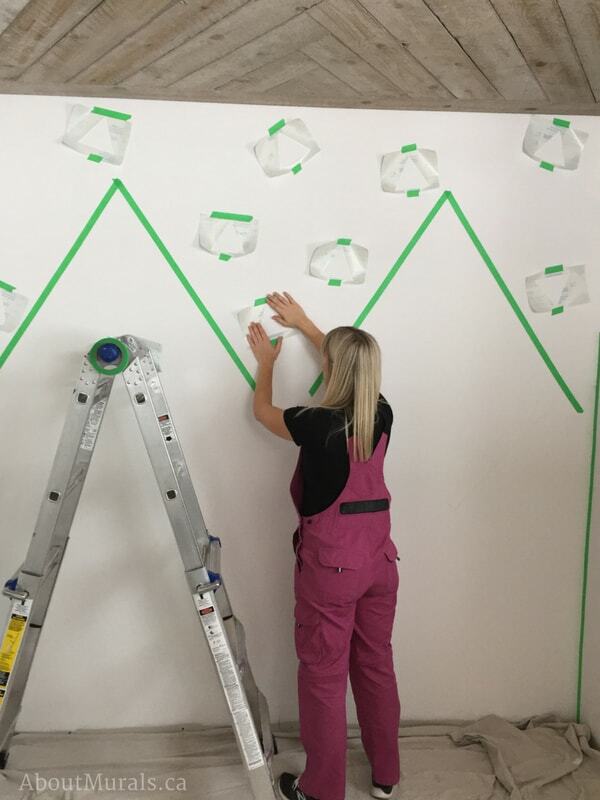 Add a horizontal piece of tape about one foot high so that the forest is the same height across the wall. 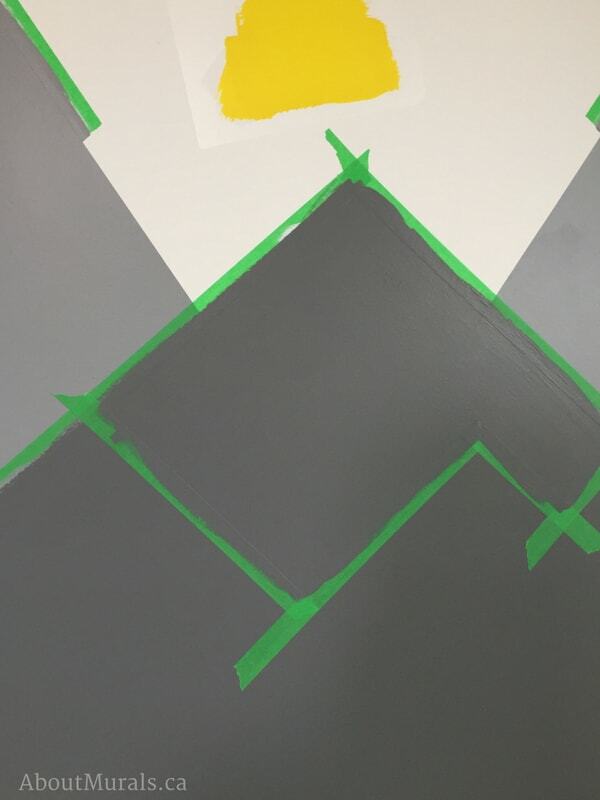 Once the forest is drawn, tape it off and seal it again with the medium grey paint. 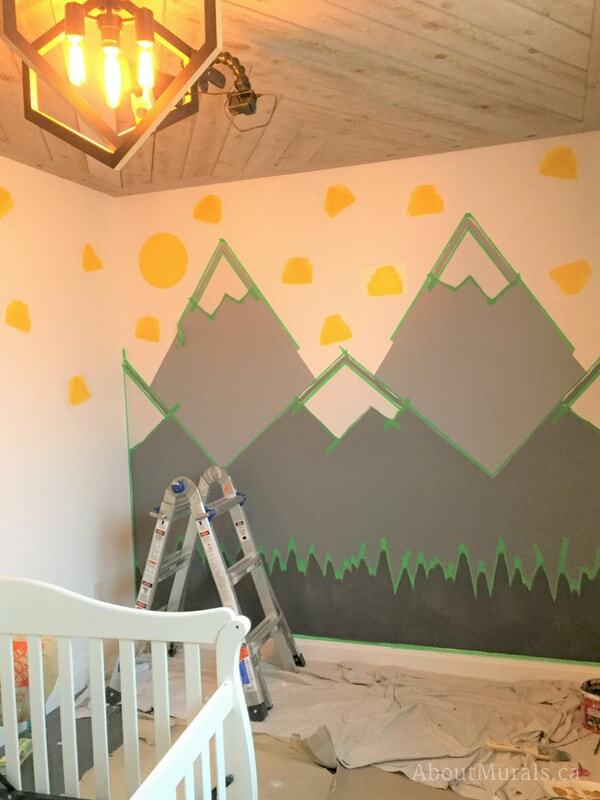 Once it’s dry, paint the forest silhouette in the darkest grey paint. 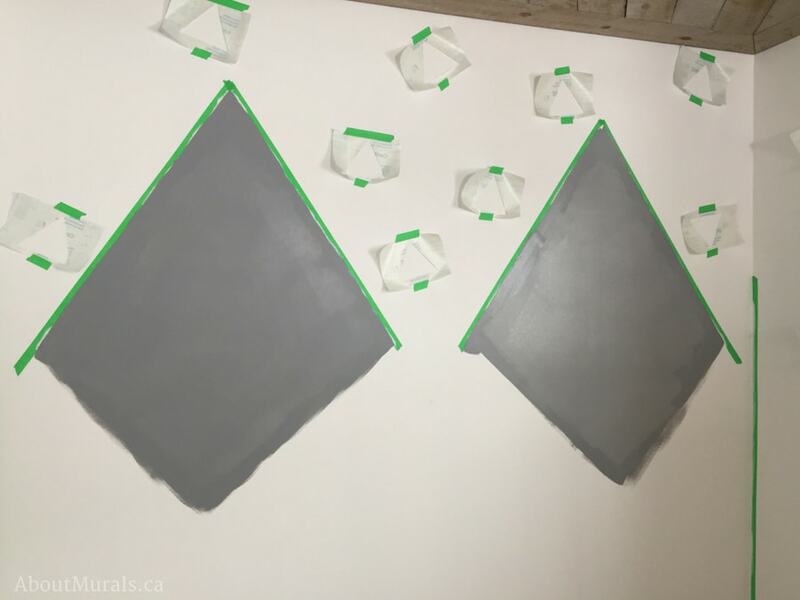 If you’re planning on adding the triangles, there’s a couple ways to paint them. I have a cricut vinyl cutter and made “stencils” out of adhesive shelf liner. I used green painters tape to place them around the room before actually peeling the backing off and sticking the “stencils” to the wall. Once the stencils were stuck to the wall, I added one coat of white paint to seal the stencil in (so the yellow paint didn’t bleed under). 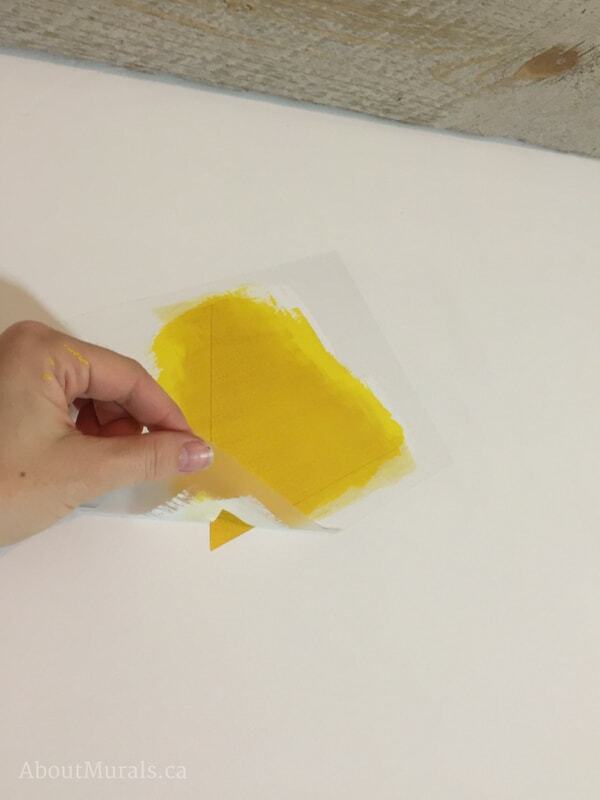 Then I added one coat of the yellow paint and 3 coats of the Americana shimmer paint over that. 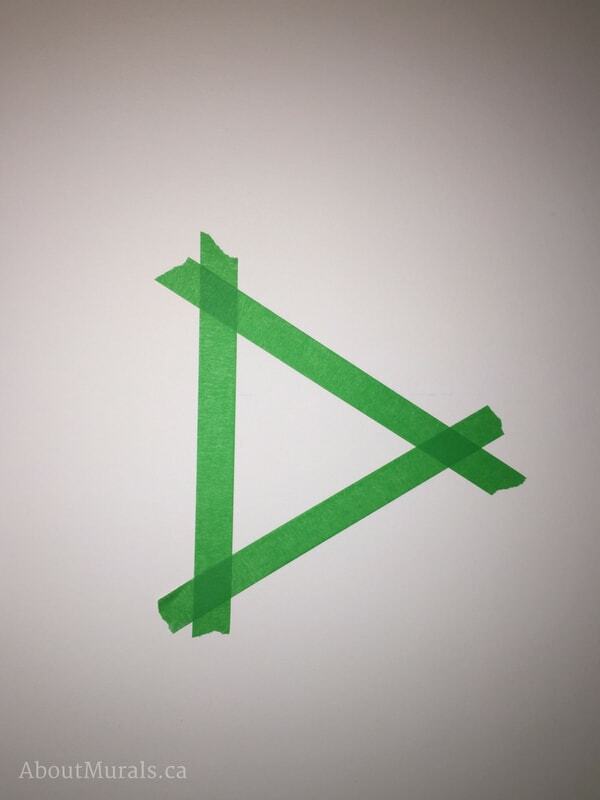 If you don’t have a vinyl cutter or stencils, just use a piece of sturdy cardstock to make a triangle. 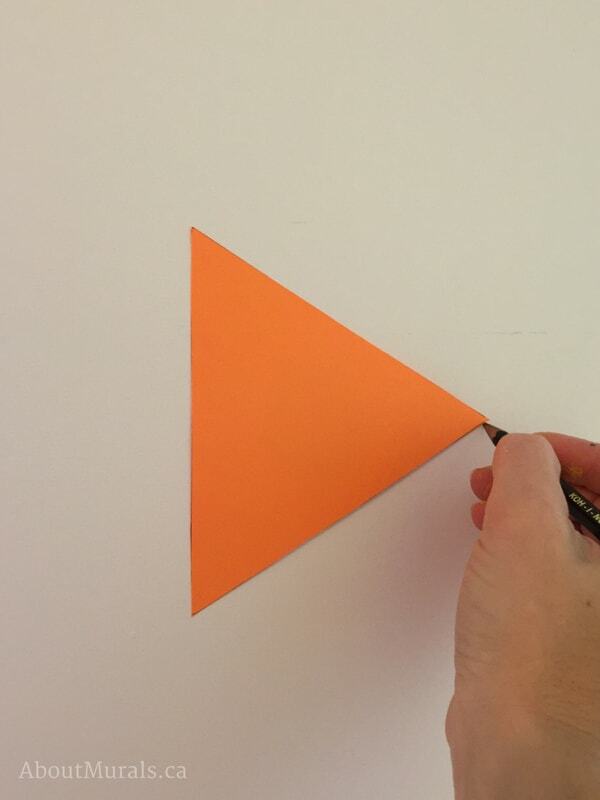 Trace the triangle with pencil throughout the room. 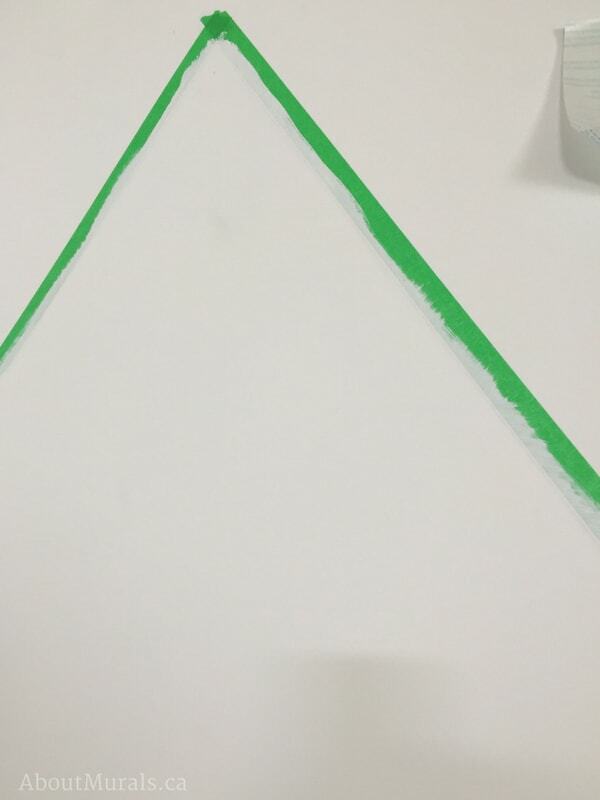 Then tape around the triangular pencil lines and follow the same steps above (one coat white paint, one coat yellow paint, 2-3 coats of shimmer paint). 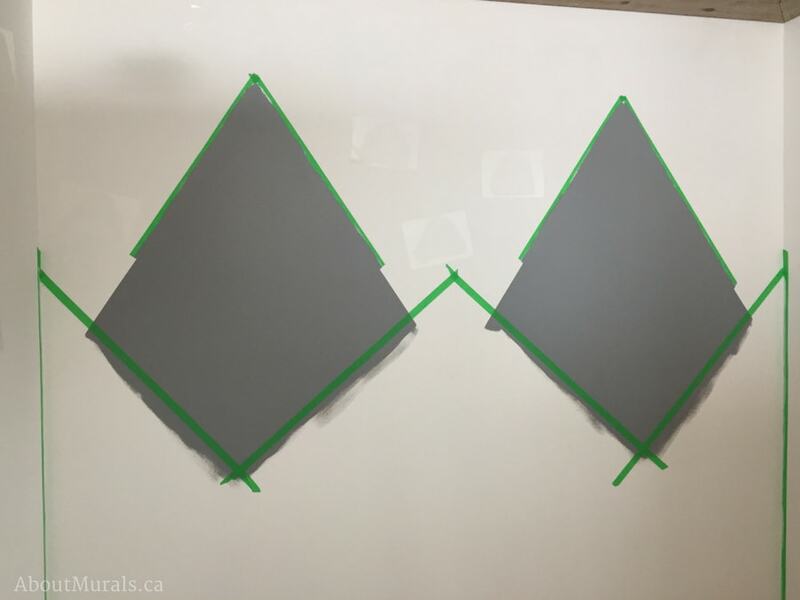 Once the paint dries, just peel the stencil off and you’ll have a perfect triangle. I have a whole blog post sharing a ton of photos of the mountain mural. More interested in seeing the crew from Holmes Next Generation? Check out all my behind the scenes photos of working with the crew on Holmes Next Generation! 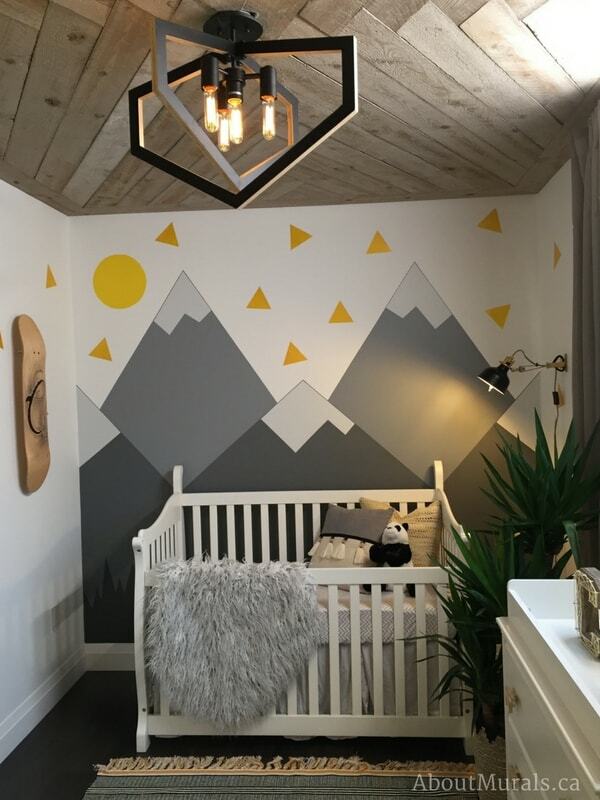 Forget the DIY Mountain Mural. Show me the wallpaper! I recreated this mural onto removable wallpaper! It ships FREE within Canada and the USA. Check it out! I’d love for you to join my newsletter community. 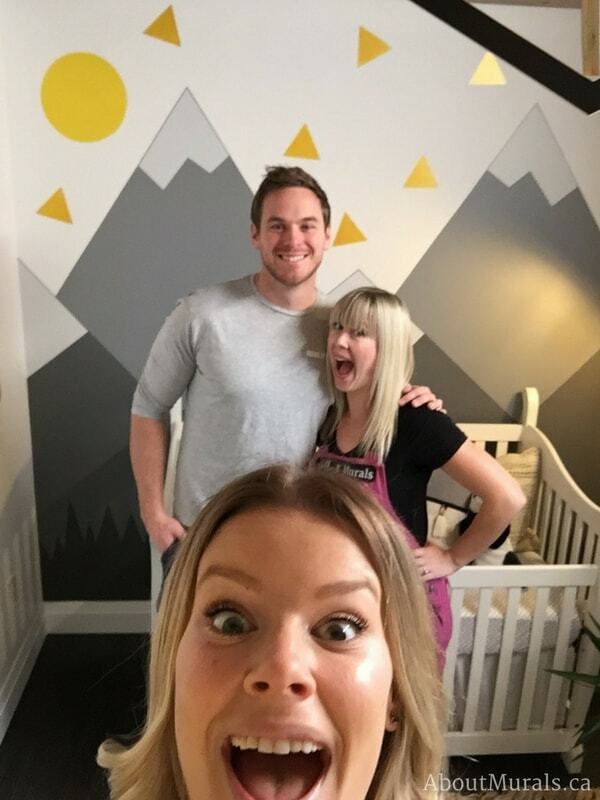 I’ll share more DIY tips, inspirational customer photos of my wallpaper murals and give you hot coupon codes! See prices & sizes for this wallpaper! Share this blog post...your friends'll be jealous you found it first! Hey! I'm Adrienne. I write my blog to inspire DIY-home-décor-enthusiasts with real life pics of my wall murals and then teach them how to get the same look. Thanks for reading!